Photo(s) by Rachel HaggertyPetoskey Brewing Co. is throwing an anniversary party—you're invited. Let us plan your weekend. Snag a ticket to these Northern Michigan events and enjoy every moment of the long holiday weekend. Get ready to rock your Friday night away with classic hits and fan favorites. The Insiders, Michigan’s premier Tom Petty Tribute Band, is bringing the best of the Tom Petty and the Heartbreakers catalog. Check out why this group of local Michigan guys keeps selling out venues all over the state with their faithfully reproduced classics. Kick off the night at 6:30 p.m. with drinks and food served before the band takes the stage at 7:30 p.m. Looking for a different wine tasting experience that is more relaxed and catered to you? Join Black Star Farms for a Premium Wine & Cheese Tasting at the Suttons Bay tasting room. This guided table service tasting will include six wines chosen to compliment your palate, along with a souvenir glass, an artisan cheese board with house-made crackers and a special sweet treat. Sit back and sip, nibble and excite your senses in the heart of Northern Michigan Wine Country. Accepting parties of 2–8 people depending on available tickets. What does craft beer, food, and live music all have in common? They’re all better when they’re local. The first annual Minnehaha Brewhaha Music Festival is bringing the best brews and bands to Arcadia Marine to kick off your Labor Day weekend. All proceeds raised from the new Northern Michigan event will go to the Ronald Stoops Memorial Scholarship at Interlochen Center for the Arts to help it become an endowment scholarship. 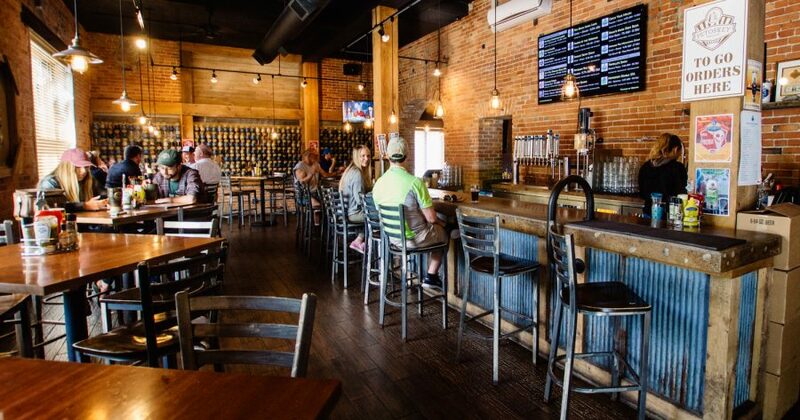 Petoskey Brewing is celebrating another year of awesome brews. And you’re invited to the party. Grab your thirsty friends and get ready to celebrate with live music by Joe Hertler and the Rainbow Seekers, Juice and more, plus a pig roast and discounted beer available all night long. Some beers will be available exclusively for the party, so enjoy them while you can. The annual Labor Day lawn concert will feature the foot stomping, “old school” Cajun music of K.Jones and the Benzie Playboys at the Leelanau Community Cultural Center’s Old Art Building. An ensemble with traditional button accordions, fiddles and washboard combine to create an authentic Louisiana dance experience. Bring your chairs or blankets and enjoy. Gates open at 6 pm. Local beer, wine and cider will be available for purchase. Nothing pairs with a plate of tasty barbecue quite like a cold beer and some rockin’ tunes. Hang out along the slopes at Treetops Resort and enjoy some stellar blues-rock featuring North Carolina’s Justin Cody Fox, regional favorite the Jon Archambault Band, Cold Shot: A Tribute to Stevie Ray Vaughan and the Silver Tongued Devils. Bring your appetite and lawn chairs. It’s time to close out the summer fashion season. Take advantage of your last chance to wear your favorite white attire as we toast the end of summer. Let’s raise a glass and dance the night away at the hottest Labor Day party in Traverse City. Visit MyNorthTickets.com for more Northern Michigan events.